Finally it worked! 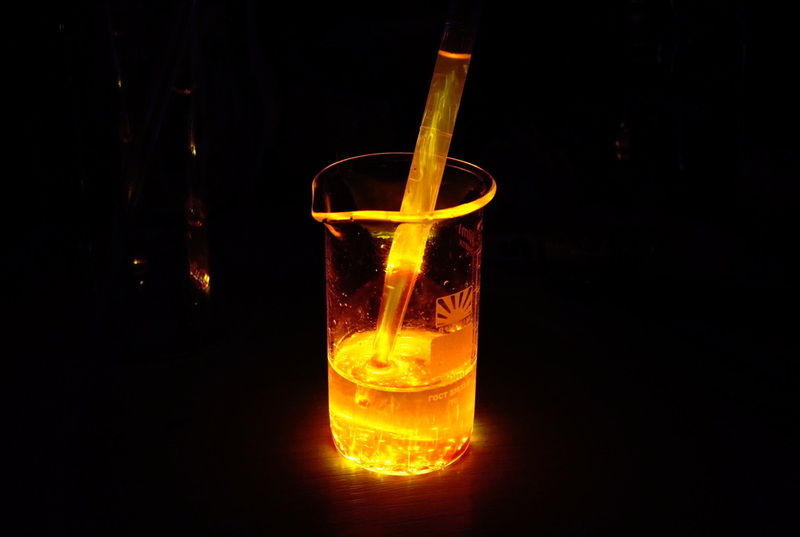 It is much more complicated than Luminol reaction. 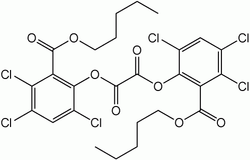 The hardest logistical part was finding CPPO (Bis-[2,4,5-trichloro-6-(pentyloxycarbonyl)phenyl]oxalate). Dyes are Fluorescein and Rhodamine R/6G. Catalyst/acidity regulator is Sodium Acetate (more common bases like NaOH or NaHCO3 were not working). It's conventional synthesis from baking soda and acetic acid is messy and painfully slow - next time going to try synthesis from sodium hydroxide. Sodium acetate is actually a pretty interesting chemical as itself due to interesting phase transitions of it's hydrate - some day I will have some fun with it. Picking solvent for reaction is another story: components are almost insoluble in water so we have to use some organic solvent. In DMSO (which worked nicely with Luminol) there was some aggressive side reaction. Ethyl acetate has extremely bad smell and is quite unsafe. One of the best and final picks was dibutyl phthalate.